Scooper - Technology News: Are robots really going to take your job? Are robots really going to take your job? Throughout history, the arrival of revolutionary technologies – such as the railroad, the automobile, and the telephone – has created vast employment opportunities for ordinary workers. Yet, today’s technology sectors have not provided the same opportunities, particularly for less-educated workers, as the industries that preceded them. This downward trend in new job creation in technology industries is particularly evident since the ‘computer revolution’ of the 1980s. For example, Lin (2011) estimates that while about 8.2% of the US workforce shifted into new jobs — associated with technological advances — emerging throughout the 1980s, the equivalent number for the 1990s was 4.4%.1 Berger and Frey (2015) further document that less than 0.5% of workers in the US shifted into technology industries of the 2000s, including online auctions, video and audio streaming, and web design. Similarly, Haltiwanger et al. (2014) show that business dynamism in the US technology sector has significantly slowed down over the course of the 2000s. The impacts of digital technologies on labour markets have nevertheless been substantial. As has been persuasively shown by Autor et al. (2003), computers have displaced workers in a wide range of routine work, including many clerking and manufacturing jobs — work that is typically concentrated at the middle of the income distribution. Accompanied with employment growth both at the top and bottom of the skill and income distribution, the automation of routine work has contributed to a hollowing-out of labour markets across the industrial world (Goos et al. 2009). Job polarisation, with some exceptions, is also already taking place in developing economies, including Macedonia, Turkey, Mexico and Malaysia (WDR 2016). The most notable exception is China, where middle-income jobs have rapidly expanded, following the offshoring of manufacturing jobs in advanced economies. Nevertheless, China may be one of the last countries to ride the wave of industrialisation to prosperity. While technological breakthroughs of the 20th century — such as the container ship and the computer —significantly contributed to the rise of global supply chains, enabling companies to locate production where labour is cheap, recent developments in robotics and additive manufacturing have made it increasingly economically lucrative for companies in advanced companies to ‘reshore’ production to automated factories. As shown by Rodrik (2015), over the course of the 20th century, peak manufacturing employment has steadily declined among emerging economies – a global trend that has to be attributed to workforce automation, posing significant challenges for future job creation in developing economies. At the same time, the potential scope of job automation has rapidly expanded and will inevitably continue to expand in the future. Historically, computerisation has largely been confined to routine tasks that involve explicit rules-based activities that can easily be specified in computer code. Recent technological advances, in contrast, have made it possible to also automate a wide range of non-routine tasks. Some tasks, such as driving a car or deciphering scrawled handwriting, were deemed non-automatable only a decade ago. Yet today, these tasks are now sufficiently understood to the extent that they can be automated. The expanding scope of automation might constitute a watershed for labour markets worldwide. According to a recent study, around 47% of US employment is susceptible to automation as a result of these trends (Frey and Osborne 2013). It is no longer only production and back office jobs that are susceptible. Occupations at risk can be found in logistics and transportation, construction, sales and services. Thus, a wide range of non-tradable sectors of economies that have in the past been safe from automation are now exposed. 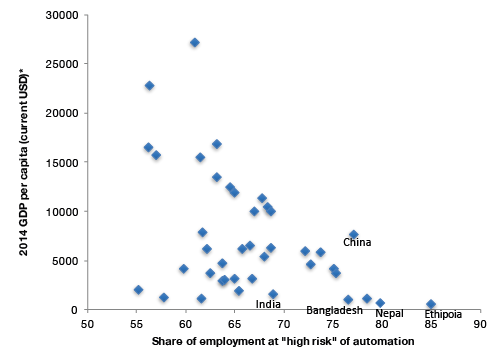 Applying the methodology of Frey and Osborne (2013), the World Bank recently estimated that the share of jobs at risk of automation is even higher in developing countries – while 57% of jobs in the OECD region are susceptible to automation, the corresponding figures for China and India are 77% and 69%, respectively, and in Ethiopia a staggering 85% of the workforce is susceptible to automation. While there is a negative relationship between countries per capita income and their susceptibility to automation (see Figure 1), leaving developing countries relatively exposed (Citi and Oxford Martin School 2016), this does not necessarily mean that they will be automated anytime soon. Because higher labour costs constitute an important incentive to automate, automation is happening at a faster pace in advanced economies. At the same time, however, it is also clear that the developing world is by no means unaffected. China is now the largest market for robots, and according to recent estimates by Citi, the payback period for robots in China is now down to two years. Yet, if technology is becoming less job-creating and more labour-saving, why are there still so many jobs? First, not all jobs that are automatable are in fact automated – despite the promise of self-service technology, there are still more than 3 million cashiers in employment in the US.Second, job creation depends on factors other than technology – importantly, most job creation since the computer revolution of the 1980s has come from non-technology sectors of the economy. Estimates by Spence and Hlatshwayo (2011), for example, show that non-tradable sectors, producing goods and services that are consumed locally, can account for as much as 98% of total US employment growth between 1990 and 2008. Around 40% of this growth, in turn, came from government and health-care services (sectors that are not primarily driven by market forces), while retail, construction, and food and accommodation industries also contributed significantly. Third, technology has had significant impacts on jobs beyond the technology sector. Technology-using sectors, such as professional services, have expanded rapidly as advances in information and communications technology has made many such jobs tradable. Furthermore, technology jobs create significant spillovers on local demand for services – one additional technology job creates around five new jobs in the local non-tradable sector (Moretti 2010). As increasingly automated factories mean that manufacturing is absorbing fewer workers, also in the developing world, the future of job creation will depend on making the transition towards more skilled modes of production. Importantly, skilled jobs are typically less susceptible to automation (Frey and Osborne 2013), and create more demand for local services (Moretti 2010). A recent study shows that multipliers for one additional skilled manufacturing job in developing countries are at least three times higher than multipliers for unskilled jobs – the multiplier for skilled manufacturing jobs ranges from 13 in Brazil to 21 in India (Berger et al. 2016). Thus, although we cannot exclude the possibility that technology may reduce the overall demand for jobs in the future, this is seemingly not an immediate concern. While today’s technology sectors produce fewer jobs than the ones that preceded them, their indirect impacts on job creation are far greater as they create additional demand for non-tradables in the local economy, in turn explaining the shift in employment from manufacturing to services experienced by most advanced economies. The fates of workers thus depends less on job opportunities created by biotech companies or computer firms, but on the demand for local services created by those companies. Indeed, the indirect employment impact of today’s technology sectors is so critical that the future of employment is likely to depend more on the size of the multiplier than job creation in technology sectors as such. While the expanding scope of automation means that a wider range of low-skilled services will become increasingly automated, potentially reducing the size of the multiplier, demand for entirely new services is at the same time being created – Zumba instructors and Beachbody coaches are now among the fastest growing new occupations on LinkedIn. Despite technological change becoming more labour-saving and less job-creating, concerns over automation causing mass unemployment seem exaggerated, at least for now. 1 These figures are not directly comparable. Estimating the share of new jobs resulting from the emergence of new technologies is associated with some measurement problems. Nevertheless, they remain suggestive of a downward trend in new job creation. Autor, D, F Levy, and R J Murnane (2003), “The skill content of recent technological change: An empirical exploration”, The Quarterly Journal of Economics 118(4): 1279–1333. Berger, T and C B Frey (2015), “Industrial Renewal in the 21st Century: Evidence from U.S. Cities”,Regional Studies, forthcoming. Berger, T, C Chen and C B Frey (2016), “Industrialization, Cities and Job Creation: Evidence from Emerging Economies”, Mimeo. Citi and Oxford Martin School (2016). Technology at Work v2.0: The Future Is Not What It Used to Be . Frey, C B and M Osborne (2013), “The Future of Employment: How Susceptible are Jobs to Computerisation?”, Oxford Martin School Working Paper No. 7. Goos, M, A Manning and A Salomons (2009), “Job Polarization in Europe”, The American Economic Review 99(2): 58–63. Haltiwanger, J, I Hathaway, and J Miranda (2014), “Declining business dynamism in the US high-technology sector”, The Kauffman Foundation. Lin, J (2011), “Technological Adaptation, Cities and New Work”, Review of Economics & Statistics93(2): 554-574. Moretti, E (2010), “Local Multipliers”, American Economic Review 100(2): 373-77. Rodrik, D (2015), “Premature Deindustrialization”, National Bureau of Economic Research (No. w20935). Spence, M, and S Hlatshwayo (2012), “The evolving structure of the American economy and the employment challenge”, Comparative Economic Studies 54(4): 703-738. WDR (2016), “Digital Dividends”, World Bank Development Report 2016.